Christian M. Sternat is licensed to practice law in the States of Texas and Ohio. 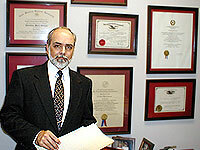 He has been board certified by the Texas Board of Legal Specialization since 1988. Born in Pasadena, Texas in 1951, Mr. Sternat lived in various parts of the country prior to his return to the Houston area in 1984. Presently Mr. Sternat is a member of: The American Bar Association, The Texas Bar Association, The Houston Bar Association, The National Association of Consumer Bankruptcy Attorneys, The Houston Association of Debtors Attorneys, and he is a Fellow in the College of the State Bar of Texas. Past lectures and legal papers by Mr. Sternat include: Tax Related Bankruptcy Issues (The Lorman Center, 1992), and Bankruptcy vs. Divorce, The Battle Continues (The North Harris County Bar Association, 1995).